Legendary Wales fly-half Cliff Morgan won 29 caps for Wales during a career that spanned seven years during the 1950s and is often mention in the same breath as Barry John and Phil Bennett in terms of influence in the Welsh game. He won a Grand Slam with Wales in 1952 and served Cardiff RFC as a player from 1948. He notably steered both sides to victory over New Zealand in 1953 - which is still the last time the Welsh beat the All Blacks. He began his international career in 1951 against Ireland, where he also briefly played for Bective Rangers in Dublin, and his instincts as a game manager and attacking weapon made him an indispensable part of the Welsh set-up. 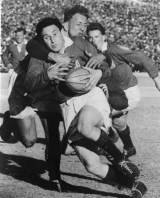 He won four caps for the British & Irish Lions during their 1955 drawn series with South Africa, scoring a try in their first Test victory at Ellis Park. Morgan was named player of the tour and made Wales captain due to his exploits before he retired from the game three years later. After hanging up his boots, Morgan became a respected commentator, broadcaster and writer and is best remembered for his description of Gareth Edwards' try for the Barbarians against New Zealand in 1973 - considered one of the greatest tries in the history of the sport. His commentary of the try went as follows: "Kirkpatrick to Williams. This is great stuff. Phil Bennett covering. Chased by Alistair Scown. Brilliant. Oh, that's brilliant. John Williams, Bryan Williams. Pullin. John Dawes, great dummy. To David, Tom David, the half-way line. Brilliant by Quinnell! This is Gareth Edwards. A dramatic start! What a score!" He suffered a life-threatening stroke at the age of 42 and was afflicted with cancer of the vocal cords in later life with the subsequent removal of his larynx resulting in limited ability to speak. He died aged 83 in 2013 after long battle with the illness.